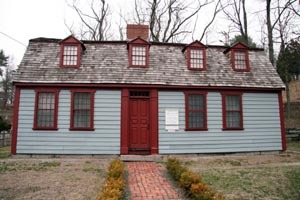 Yesterday Dale and I visited the birthplace of Abigail Adams for a photo shoot of the finished Fionn sweater. 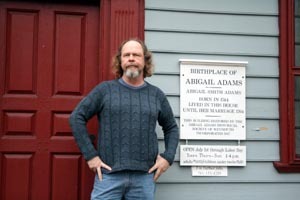 Since I knit quite a bit of this sweater while watching John Adams on HBO we thought it was a fitting place for an excursion. 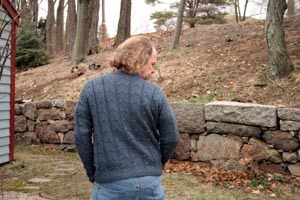 The weather was chilly and the skies were gray but Dale was warm in his new sweater. I think the fit is a bit small but it’s just what he wanted. In his words, “I want a sweater that fits like a shirt.” Good thing I knew what he meant. 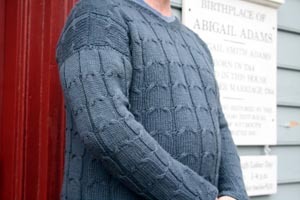 The pattern is terrific and available from Figheadh Yarnworks. I’d highly recommend it. 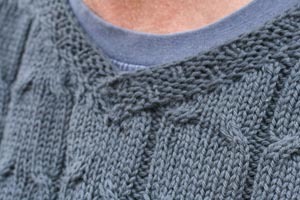 It’s simple and straightforward, knit in the round from the bottom up and then the sleeves stitches are picked up and knit down. Easy peasy, this one. The yarn is Ella Rae Classic, purchased online from Lavender and Peonies. It’s very reasonably priced and comes in loads of colors. 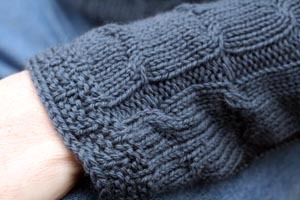 More pictures on flickr, more details on Ravelry, by the way. After a quick stroll around the grounds we headed home. Dale’s with his new sweater and me with my new pictures. We were both pretty happy with the outcome of this trip. Fantastic sweater! I’ll have to add that pattern to my queue. Beautiful job on the sweater Carole! nice. that color is great too. That came out awesome! I love the color. Great idea for the photo shoot. My husband and I are hoping to catch up with that show when it comes to DVD, it looks really good. very nice. glad he loves it. Your photos are terrific…and Dale looks all well! Hooray! beautiful sweater! I like the way it fits too – The color is perfect for Dale! And, it looks super with jeans. Beautiful job on that sweater! I love the color, too. I don’t think the sweater is too small at all. It looks great on him and is a perfect fit. My bf likes his sweaters to be oversized. All a matter of personal preference. Dale’s sweater is a beauty. I’m glad he’s feeling better and he looks like he’s healed up well. What a great men’s sweater! Just enough detail to keep the knitter awake, not so much detail to scare the wearer. 🙂 Looks like his eye is improved too! I like the cuff detail. It looks a bit like brickwork. Now *that* should have been an Eye Candy Friday post — there is NOTHING wrong with the fit of that sweater! I always enjoy the bits of history you work into your posts. Thank you. What a fabulous sweater – and the details of your finishing look marvelous as well. I love how the patterns line up on the shoulder. That pattern has a great design for a man’s sweater. Congrats on a wonderful completion Carole! You’re so lucky to live on the east coast where the beginnings of our great nation were shaped and formed. What a perfect spot for your photo shoot. I’m so glad we have HBO so we can watch John Adams also. I’m completely fascinated with it. 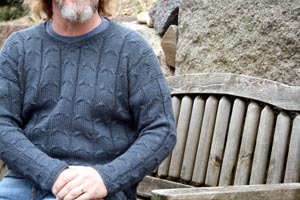 Note to self: Don’t show hubby the amazing and stunning sweater that Carole knit for Dale. 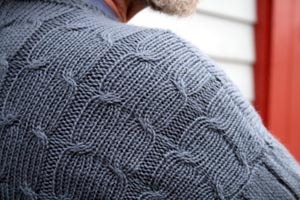 It’s just too perfect for words, and hubby would want it immediately in the same yarn and the same color. Aww. Dale feels loved. Great job! Great guy sweater. I just love that last pose of Dale’s…so um, male-modelish! OMG, I’ve been away from the blogs for a couple weeks, and look what happens! A gorgeous sweater, which I have to say, fits him perfectly. I happen to think that most men’s sweaters are too big, so I agree with Dale on this one. But, also, OMG – his eye! I had no idea. I’m so sorry. How is he now?